Mystery. It's everywhere. There's a mystery to everything. A hidden tale or thing behind it. It makes us wonder about the mystery the more we think about it; the more we went to drive deeper into it and solve it. Bring it to the light of day. One of the many mysteries out there are ghost, demons, and monsters. The unknown. Why are they here? Why do they do the things that they do? From haunting, to scaring, to possessing people and animals? To answer these mysteries that people have been wondering for many years, come and join the Mystery Chasers as they deal with real ghost, demons, and monsters. What are they? : Ghost, Demon, Monster, ect. 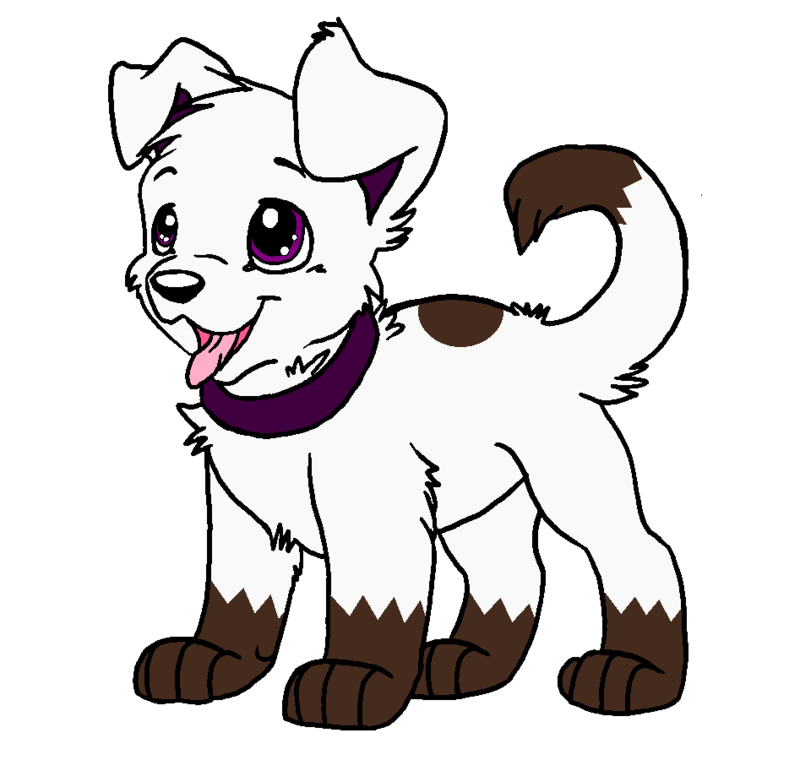 Personality: Mystery is a very kind and friendly little puppy. He is timid, and easily frightened. He'll go and hide at the first sign of danger. Though, if his family or friends is in danger, he'll do everything in his little puppy power to try and save them. History: When he was born, his ghost friend, Spooks, touched him, wanting to pet him and be friends with him since he was so cute. In doing so, the puppy has ectoplasm running through his veins. An evil tree lady by the name of Shiroimori is after him to drain him of his blood so that she can control ghosts. 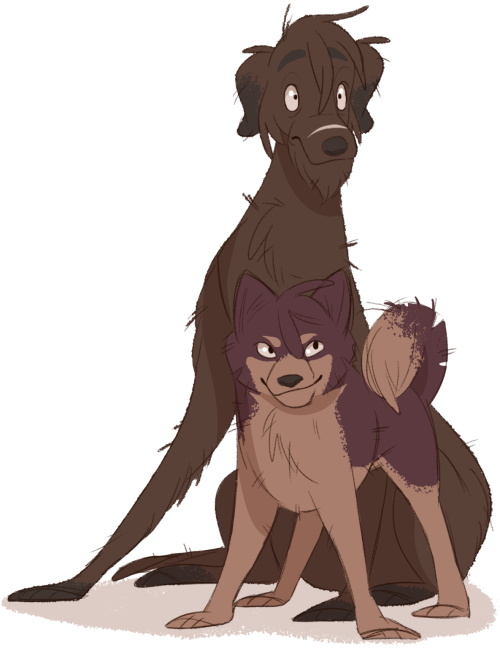 Before that, he lived with other canines with colored marking until a mysterious figure caused his family to be scattered, forcing him to try and live on his own. He picked up Japanese by hiding out near Japanese schools. he also learned how to read, write, talk through doing so. 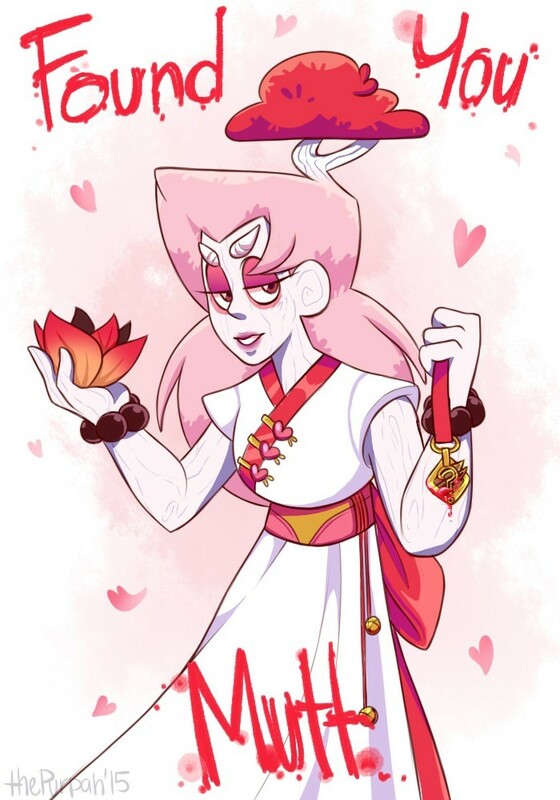 He encountered Red Forest, the sister of White Forest, who explained that not only was she the one who scattered his family, but that she had been methodically killing his relatives one by one until the only one that remained was Mystery himself and, being the self respecting “leader” of a “kaiju/yokai hunter clan she claimed to be, she wasn’t going to stop until he was dead. Hearing that, he fled. He’s encountered her several times after that, fleeing every time. When he fled into the forest to escape, he got caught by a trap that injured one of his hind legs. Stuck there, hurt and afraid, Scrags and Amy found him and helped him get free from the trap and his injured leg fully healed with their help. Other: He's Amy and Scrags' dog and the mascot of the Crime Chasers. Personality: Don't let her... cheery face fool you, she's evil. She mean, cruel, and very dangerous. She can manipulate people easily and will do whatever she needs to get what she wants. No matter what cost. Personality: Howler is mean and cruel. A normal-styled bully. He enjoys picking on those smaller and weaker than he is. He's just felt out mean and nasty. Not a puppy you'd like to run into. Other: He part a pack of dogs in the city where the Crime Chasers stay. Howler and his gang like to bully Mystery. 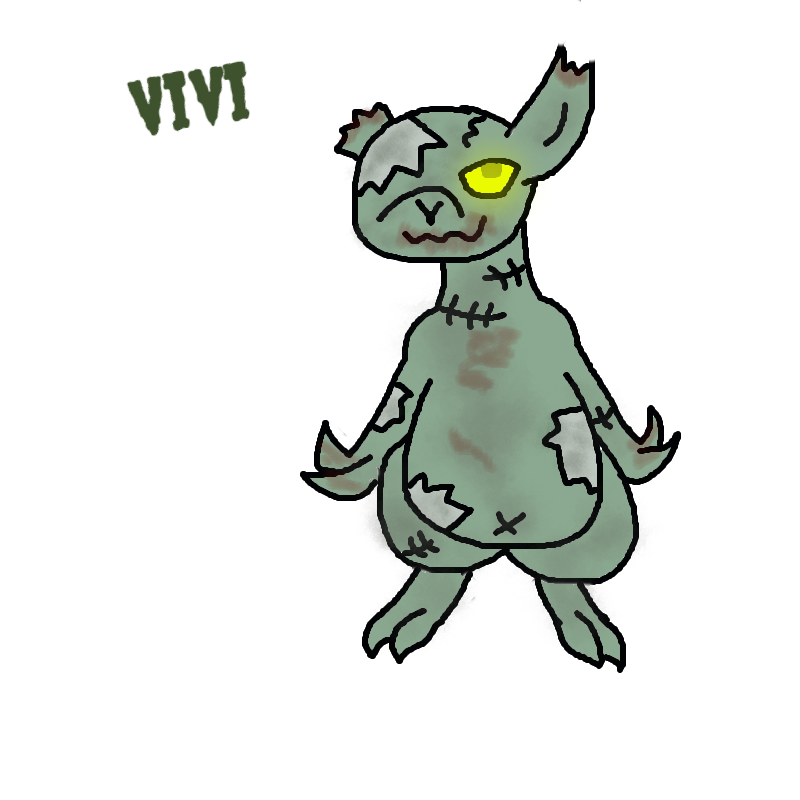 Personality: Vivi is a brave zombie rabbit. Shockingly.. He's so brave, he'll go and charge right up to the monsters, real or fake, and Mystery has to get him away before the green bunny gets himself killed. Again. Other: Part of the Mystery Chasers. He's sort of like Scrappy in the sense of trying to take on the danger when he really can't. Age: Unknown, appears to be an adult hound. Powers: Illusions: Has the power to create illusions to mess with people. Fire: Has the power to shoot fire out of his mouth, fire to appear on his paws, and tail. Super Speed: The power to run fast. Enough said. Super Strength: Pretty easy to understand with this one. Weakness: Unknown. I'll edit it later once I think of some. Personality: He's a tricky hound, and he dreams of ripping Mystery apart piece by piece. He loves to talk in riddles at times. Its more fun to leave the puppy guessing. He loves to play mind games with the canine, as he likes to mess with his head, sort of like Shiroimori and Okiniiri do. History: No one know his history. Apart from that he's been alive for many years, causing trouble for everyone all over the world. He was sent to the fiery pits of hell, where he belongs. However, someone went and sent him free, allowing him to cause trouble once again. He set his sights on Mystery and he's going to make the puppy's life quite literally, a living hell. What are they? : Human-looking tree thing? Personality: Same as her sister's pretty much. Only more cruel and dangerous. Other: Shiroimori's sister and leader of a hunters clan. She's out to kill Mystery. Rayquaza Doubt [Murder Mystery Game] Game 2!